Here are a couple of the entries from our Journalism Game Jam (described below). Contributes to the many participants for their creativity and collaboration! We also wanted to encourage people to read news from reputable sources and read more from news sources around the world. 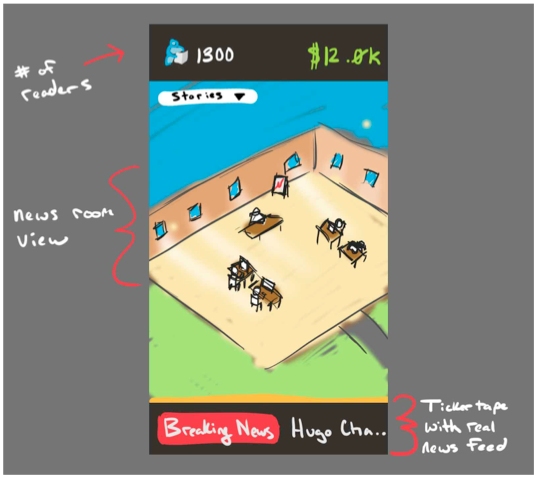 We think tying a game experience to real world events will make the player have a more personal connection to the news. The player starts off as the publisher at a small local newspaper. In the main part of the game they manage their staff and assign stories and beats. Some stories and events are brought directly in from real life news sources. The game is also embedded with links to real news sources in news alerts and in a ticker tape that runs at the bottom of the game. Can video games save journalism? It might sound like a silly question. But the economic foundations of traditional print journalism have been dissolving in the new media environment. Publishers and editors have struggled to discover new ways to preserve the democratic function of a free press when advertisers have moved to cheaper, more targeted means to reach consumers and readers have become accustomed to getting the news for free over the Internet. “Gamification” has emerged as one tool among many to engage a new generation with the acts and importance of public-service journalism. To explore how video-gaming can improve journalism (and vice versa), UVic students (including game developers, visual artists, writers and journalists), outside experts and anyone else with an interest in the subject will engage in an all-day “game jam” (a combination of a “design charrette” and “hackathon“) to generate ideas for, mock-up prototypes and even code “newsgames” that will try to restore the value and power of journalism for the networked age. Participants will be mentored by leading experts in the fields of journalism and game design, including Sean Holman, the founder of PublicEye Online and assistant professor of journalism at Mount Royal University. The Gam Jam will run (roughly) from 10:00 am till 6:00 pm on Saturday, March 9, in the David Strong Building. Ideas will be pitched at the end of the conference (5:00 pm) to an expert panel of game company executives and journalists. Awards will be handed out in various categories. The world will be saved. Want to take part? You don’t need to be a coder or a J-school student. You just need a curious mind, a creative spirit, and a love of collaborative problem-solving. Drop us a query at techsoc@uvic.ca or sign up right now in the form below.